A nice interview with Jacques Roubaud (the guy responsible for Bourbaki’s death announcement) in the courtyard of the ENS. He talks about go, categories, the composition of his book $\in$ and, of course, Grothendieck and Bourbaki. Clearly there are pop-math books like dedicated to $\pi$ or $e$, but I don’t know just one novel having as its title a single mathematical symbol : $\in$ by Jacques Roubaud, which appeared in 1967. 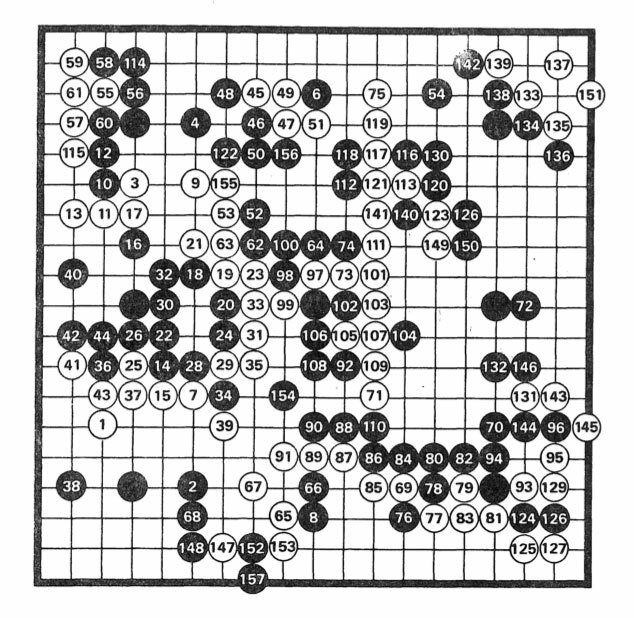 In the interview, Roubaud tells that go became quite popular in the mid sixties among French mathematicians, or at least those in the circle of Chevalley, who discovered the game in Japan and became a go-envangelist on his return to Paris. In the preface to $\in$, the reader is invited to read it in a variety of possible ways. Either by paying attention to certain groupings of stones on the board, the corresponding texts sharing a common theme. Or, by reading them in order of how the go-game evolved (the numbering of white and black stones is not the same as the texts appearing in the book, fortunately there’s a conversion table on pages 153-155). Or you can read them by paragraph, and each paragraph has as its title a mathematical symbol. We have $\in$, $\supset$, $\Box$, Hilbert’s $\tau$ and an imagined symbol ‘Symbole de la réflexion’, which are two mirrored and overlapping $\in$’s. For more information, thereader should consult the “Dictionnaire de la langue mathématique” by Lachatre and … Grothendieck. 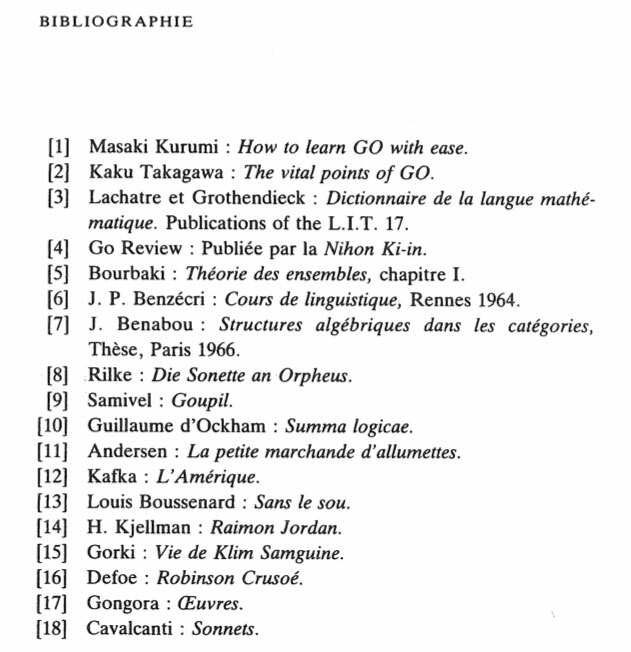 According to the ‘bibliographie’ below it is number 17 in the ‘Publications of the L.I.T’. 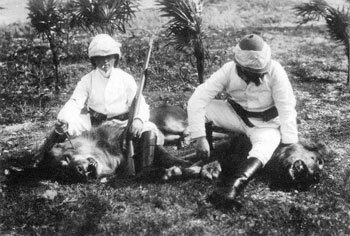 A classic among mathematical jokes is the paper in the August/September 1938 issue of the American Mathematical Monthly “A contribution to the mathematical theory of big game hunting” by one Hector Petard of Princeton who would marry, one year later, Nicolas Bourbaki’s daughter Betti. There are two main sources of information on the story behind this paper. There are Frank Smithies’ “Reminiscences of Ralph Boas” in the book Lion Hunting & Other Mathematical Pursuits and the transcript of an interview with John Tukey and Albert Tucker at Princeton University on 11 April 1984, part of the oral-history project on the Princeton mathematics community in the 1930s. I’ve made a timeline of the 16 different methods contained in the paper, keeping their original numbering and formulation. Enjoy! If this is completely obvious to you, stop reading now and start getting a life. For the rest of us, it took me quite some time before i was able to parse this formula, and when i finally did, it only added to my initial confusion. Though the Bourbakis had a very preliminary version of their set-theory already out in 1939 (Fascicule des Resultats), the version as we know it now was published, chapter-wise, in the fifties: Chapters I and II in 1954, Chapter III in 1956 and finally Chapter IV in 1957. In the first chapter they develop their version of logic, using ‘assemblages’ (assemblies) which are words of signs and letters, the signs being $\tau, \square, \vee, \neg, =, \in$ and $\supset$. Of these, we have the familiar signs $\vee$ (or), $\neg$ (not), $=$ (equal to) and $\in$ (element of) and, three more exotic ones: $\tau$ (their symbol for the Hilbert operator $\varepsilon$), $\square$ a sort of wildcard variable bound by an occurrence of $\tau$ (the ‘links’ in the above scan) and $\supset$ for an ordered couple. The connectives are written in front of the symbols they connect rather than between them, avoiding brackets, so far example $(x \in y) \vee (x=x)$ becomes $\vee \epsilon x y = x x$. If $R$ is some assembly and $x$ a letter occurring in $R$, then the intende meaning of the *Hilbert-operator* $\tau_x(R)$ is ‘some $x$ for which $R$ is true if such a thing exists’. $\tau_x(R)$ is again an assembly constructed in three steps: (a) form the assembly $\tau R$, (b) link the starting $\tau$ to all occurrences of $x$ in $R$ and (c) replace those occurrences of $x$ by an occurrence of $\square$. Okay, let’s try to convert Bourbaki’s definition of the emptyset $\emptyset$ as ‘something that contains no element’, or formally $\tau_y((\forall x)(x \notin y))$, into an assembly. But, can someone please explain what’s wrong with $\tau_y \neg \in \tau_x \in \square_x \square_y \square_y$ which is the assembly corresponding to $\tau_y(\neg (\exists x) (x \in y))$ which could equally well have been taken as defining the empty set and has a shorter assembly (length 8 and 3 links, compared to the one given of length 12 with 3 links). Hair-splitting as this is, it will have dramatic implications when we will try to assemble Bourbaki’s definition of “1” another time.